As you know, there was no twilight racing Thursday night due to Race Week. Instead we were treated to Jennifer & Steve Uhl’s gracious hospitality – again! That, by the way is a direct quote from last year’s RW RTTC. Honestly, I’m not sure how many years in a row they have opened their home to us during Race Week, but as always, they pulled out all the stops and continue to outdo themselves. Many thanks to them, and also to Dave Reynolds for making sure we all got enough to drink. So let’s start with Junior Race Week. Close to 250 kids descended on what has become a centerpiece of the junior racing schedule. As always, the event ran Monday through Wednesday, and split the fleets up into four lines for 420s, Lasers, Opti Champs and Opti Greens. 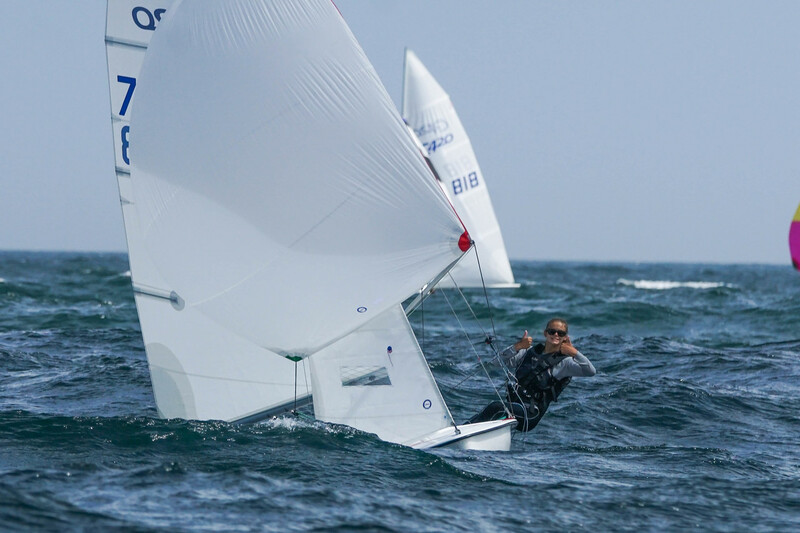 The Opti Champ fleet was largest at 55 boats followed by the 420 Champs at 46 boats. Rounding out the fleets were Laser Radials, 420 Green and Opti Green. 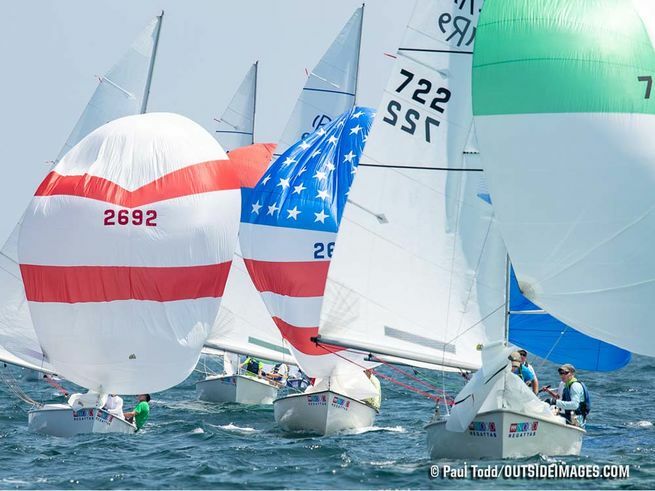 Although it’s not uncommon for this event to include its share of fog, drizzle, glassy water and a lot of sitting around waiting for the breeze to fill in, this year it was Buzzards Bay. Monday’s conditions included a solid 15 knot southeasterly with impressive seas. Tuesday featured a ton of sun and a very solid mid-teens out of the southeast, and Wednesday was a carbon copy. Jealous parents looking ahead to their own RW were definitely wringing their hands after sneaking a peak at the Thursday-Sunday mostly single digit forecast. Lucky little buggers! Anyway, here’s a view from the top of Pegasus showing the start of race 12 and the marvels of the I-flag. If you’re interested in watching a clip of a start, click here. Several Fleet 5 spawn competed in this event, and hopefully I catch them all. 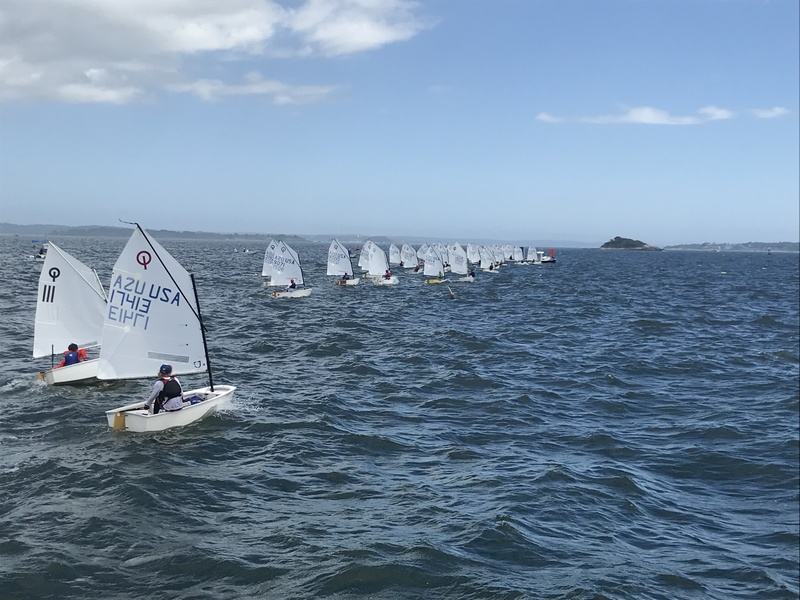 The biggest contingent again this year was in the 420 Champ fleet, including Jack Dalton (5th), Wilson Kaznoski & Nolan Adam (7th), Sophie Lane (17th), Christopher Pandapas (26th), Ashley Hoguet (27th) and Haley Nelson (36th). Two competed on the 420 Green line, including Molly Lane (11th) and Sophia Ianchulev (12th). One Fleet 5er competed in the Laser Radial, William Dailey (7th), and one also in the Opti Champ fleet, Max Westhoven (9th). 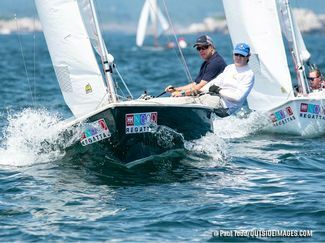 Two competed in the Opti Greens, including Alex Ianchulev (2nd) and young Courtney Hoguet (3rd), who you may recall was at the helm on dad’s R19 at the David J. Smith a few weeks ago. Congratulations to all. Worth mentioning is the incredible Opti Champ performance of Pleon sailor Leopold Seuss, who put on a lights-out performance like I have never seen. In 12 races in a fleet of 55 boats, he earned 12 bullets. He led at most every mark. When was the last regatta you threw out a 1? Just amazing. As in years past, legions of Fleet 5 members volunteered to support this regatta. Two of the four PROs are card carrying members of Fleet 5, including Conway Felton on the Laser line and yours truly on the Opti Champ line. 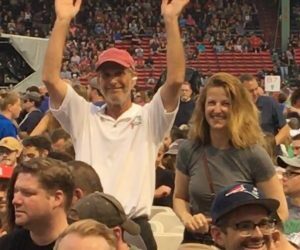 Other Fleet 5 RC contributors included the usual suspects of Christina Pandapas, Peter Frisch, Seamus Hourihan, Frank McNamara, Alex Felton, Joe Fava, Mike Lane, Rob Ferro, Kent Hallawell, Barbara Hallawell, Ken Adam, Chris Adam, Lisa Adam and Fleet 5 alum John Todd. Add to that a bunch of folks who served as safety boats, plus honorary member Rick Myers who served as a judge. I’m sure I missed a bunch, so sorry, but it’s clear Fleet 5 members again stepped up in a meaningful way. Thanks to all. So let’s get straight to the bottom line. Congratulations to Dave Nelson and longtime crew Ken Delpapa who put on an absolutely dominant performance. They sailed consistently from start to finish, exhibiting patience, smarts and good decision-making. 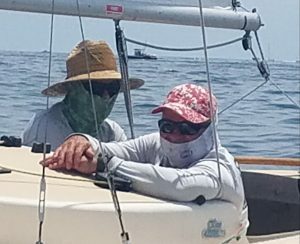 Their victory was a foregone conclusion after Day 2, in which they earned four bullets and pulled so substantially out in front that the rest of us were immediately resigned to sailing for 2nd place. Over ten races, they put up a line of 1-4-1-1-1-1-6-3-3-1 for 16 points after tossing the 6. Ten races over three days against that competition and they threw out a 6. Really remarkable! Here’s a view of Dave we didn’t get to see very much this week. Behind Dave were several boats all in striking distance of 2nd, but who never got the chance to close the deal due to the Day 4 abandonment. So benefiting from that and taking 2nd with a line of 14-6-4-7-6-5-1-5-2-2 for 38 points was Team Pandapas. Finishing 3rd just six points behind them was Team Cooke/Kaznoski with a line of 6-9-10-6-2-8-2-6-1-4 for 44 points. Honorable mentions go to Team Fava/Eisner in 4th with 51 points and Team Frisch/Hourihan in 5th with 58. Congratulations to all. You’ll find the complete scores here. Day 1 started with a sketchy forecast involving a 10-15 knot southwesterly that moderated over the course of the day, with the possibility of thunderstorms that could blow it all up. They didn’t blow up any races, but the radar got just ugly enough to encourage the RC to pull the plug after the second race. Turns out they were right to send us in as the sky got pretty threatening. Here’s a shot of the harbor courtesy of Walter Colsman. Just two fleets, the R19s and IODs, still race Thursday as a part of a 4-day Race Week. The Etchells sail Thursdays, though inexplicably, call it an unscored practice day. I heard a little grousing about having to reach around waiting for their starts, and in some ways it probably doesn’t make sense for them to sail with fleets actually competing for RW, but that’s all way above my pay grade, and I’ll probably get in trouble for even mentioning it, but I digress. Anyway, the BYC provided RC services, with an assist from a CYC patrol at the top. 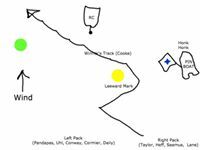 They dropped anchor about a ¼ mile beyond Satan’s and set up a course of 185 / 0.8 miles for us and longer for the IODs and E22s. Right definitely paid and everyone wanted it, so that combined with a boat-biased line made the boat a popular place to start. That didn’t bother Larry Ehrhardt, who on at least one race took a lot of sterns to get over there, and ultimately won the day handily with a 3-1 for 4 points. Taking 2nd just one point back was Dave Nelson, who put up a 1-4 for 5 points. And finishing 3rd was Team Heffernan/Harsono, with a 7-2 for 9 points. Honorable mentions go to Team Taylor in 4th with a 2-7 for 9 points, and Team Cooke/Kaznoski in 5th with a 6-9 for 15 points. Friday conditions were perfect. We got a southeasterly that started in the range of 5-10 that gradually built through the afternoon so that the last couple of races were in the 12-13 range. The breeze oscillated by as much as 10 degrees off median, but never for long. That combined with small pressure differentials across the course forced you to stay on your toes and simply buying one side versus the other would have been too narrow a strategy. That said, I think right probably paid more than left. Whatever it was, Dave Nelson certainly had it figured out as he rolled double snake eyes, a 1-1-1-1 for 4 points to win the day and position himself as virtually untouchable for the regatta. The first of those wins involved his taking advantage of an unforced error by the boat in front of him, but, isn’t that what sailing is all about? Dave, as much as anyone I know, has a way of hanging around the hoop waiting for others to miss the rebound. Anyway, he got good starts, sailed smart and sailed fast all day – really well done. Taking 2nd was Team Shoreman/Reynolds, who put up a 2-3-12-2 for 19 points, and finishing 3rd was Team Pandapas with a 4-7-6-5 for 22 points. Honorable mentions go to Team Fava/Eisner, who took 4th with an 8-5-4-6 for 23 points, and Team Frisch Hourihan in 5th with 7-4-9-4 for 24 points. 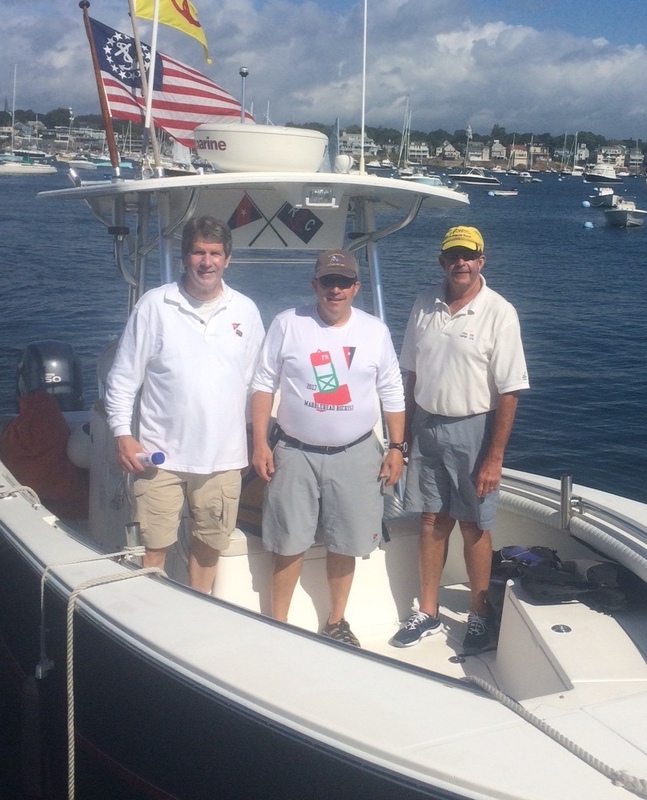 A huge shout-out to PRO Rick Hamill and the CYC RC, who did a superb job all day. They kept things moving, minimized reaching, set square lines, set good courses, etc. – just top notch. Without a doubt, the best RC performance of the season for us. Saturday featured another beautiful sailing day with conditions that included a partly cloudy sky, an 8-10 knot southeasterly that crept into the 11-12 range from time to time, and a pretty stiff current that turned with the outgoing tide at about 12:45. The practical implication of that was that left paid during the first race as you could ride the conveyor belt on port tack into the mark, and right paid after that as you could avoid the stiffer adverse current by staying in the shallower water. That of course was just the tide play. We also saw pressure differentials across the course and oscillations in the 10 degree range, so a little tricky and a lot to think about, but generally a perfect sailing day. A lot of boats made money on the immediate jibe at the weather mark, allowing the current to carry them down and effectively lay the left gate. Another solid RC performance allowed us to get in four races, though a couple of those included the extra intrigue of occasional fleet convergence on legs and mark roundings. That’s hard to avoid when you’re running multiple races on a line with three different classes, but also a little crazy for the sailors because the boats all sail such vastly different angles. All of this seemed not to bother Team Pandapas, who put together a day reminiscent of 10 years ago, rolling a 1-5-2-2 for 10 points to win the day. Taking 2nd on a tie breaker was Team Cooke/Kaznoski who put up a 2-6-1-4 for 13 points, and finishing 3rd was Dave Nelson with a 6-3-3-1, also for 13 points. Honorable mentions go to Team Fava/Eisner in 4th with a 4-1-8-12 for 25 points, and Team Taylor in 5th with a 9-7-7-5 for 28 points. The forecast was for a light northwesterly that was supposed to go left and weaken. I’m sure there was some of that on shore, but it never really made it out to our line, nor the other two offshore lines for that matter. We drifted around for a about 1½ hours before the RC wisely pulled the plug. The only line to get a race in was the Lasers, who sailed one race. So, a few final thoughts in no particular order. * This fleet is tough. There are not a lot of holes in our lineup. * Anybody noticed the small lobster-looking boat out on the race course on Friday, with three Fleet 5 alums sitting in beach chairs watching the racing? Great to see Shan McAdoo, Jerry Blouin and Doug Trees, all of whom could probably still come out and win a race today. * In junior RW, Pleon sailors won all but two of the eight divisions. How awesome is that? * It sure was nice to see Jerry & Nancy Blouin at the party. Like they never left. * I said this last year too – I love the way Dave Nelson sails. It’s not just about winning, but also about how you win, and he wins well. * Love seeing Ashley Hoguet on the helm, especially after sailing junior RW too. That kid is a gamer. * Ditto to Will Dailey, who sailed three days of Laser Radials in junior RW and then came out and sailed with his dad. Another gamer. * Speaking of Daileys, so great to see Tom & Will Dailey get dialed in, particularly on Friday. You could see the smiles from across the course. * Sure wish the CYC had two cranes. * How does Steve Uhl stay so calm all the time? * Team Cooke/Kaznoski are ungodly fast downwind. * Vipers and Rhodes rounding a weather mark together is a bad combo. Team Pandapas had won broach right on top of them as they were setting the chute on Friday. 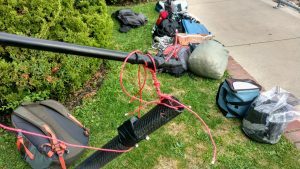 The mast missed but the chute wrapped around the standing rigging. * Congratulations to Ben Richardson on winning the 31 boat Laser fleet. Anybody notice that he’s calling his boat ‘Has Ben?’ Pretty funny but clearly a misnomer. So, in Cup competition, the numbers have gotten a lot bigger and the order shuffled a little. Dave Nelson jumps onto the board on the strength of his RW performance. The top 10 are listed below. Week 11 racing will include Twilight 2-3 on Thursday night, the 2-3 races of MRA Series 3-1 this Saturday and the informal (unscored) CYC Cooke Town Class Sunday Series on Sunday. Sportsmanship Update – So here’s a question for you? If the boat right next to you is called over, suggesting you might also be over, but your number is not called, do you go back? Tough call, right? That situation came up on Day 1. Do the right thing or possibly get away with one – an ethical conundrum. Fact is that the hails are just a courtesy, and it’s up to each of us to start correctly. Anyway, first as to old news, we got this email from Alex Felton a little late and applies to racing on Series 2-3 two weeks ago. “Sign Team Felton up for a circle on Race #2 on last Sat as we hit windward mark second time around.” Done, thanks. As to RW, we heard of several spins, but remember just three. Team Sheldon/Susa spun after hitting the weather mark, Team Frisch/Hourihan spun after contact with another boat and Team Rubin after a mark-rounding foul. Please let me know who I missed. So below are the standings, and thanks to those on it for their sportsmanship. Remember, if you spin, send it in. Labor Day Party – Circle Saturday September 1st for our annual Labor Day Party, which this year will hosted by old friends Vonda & Jim Raisides after sailing. Like we did last year, we’ll going to mix it up with our friends from the J70 fleet. More details to follow. Our account of the S-flag incident last week generated some comments. The first was this FB comment and picture from Nat Taylor. “Lost their minds might be an understatement, because the light air made for an epic amount of bobbing and weaving in a very short distance. I drew a picture to immortalize the moment. The other was from Jocelyn Cook, who wrote, “I always find the newsletters informative but holy smokes – clearly a good thing to learn RE: the S Flag. Being so far in the back of the pack , I missed the opportunity to even see the chaos yesterday, though kept hearing the call on the radio “Rhodes there is an S flag, this is your finish”. Thanks for the pic on Facebook Nat – super helpful illustration!” Hmm. We usually shut off our radio after the start so didn’t know the RC was broadcasting that. Good for them. Nat Taylor showed me this picture on the porch after RW of Steve Uhl’s repaired tiller extension. Really, no words do this justice.